If Berklee College of Music President Roger H. Brown gets 100 percent cooler every year over the next two dozen years or so, he said Friday, he figures he'll be about half as cool as Willie Nelson. The "hippest octogenarian on planet Earth," as Brown called the country legend, will be awarded an honorary doctorate today at Berklee's commencement alongside fellow innovators Carole King and Annie Lennox. All three were on hand last night at Boston University's Agganis Arena (which can accommodate about 8000, far larger than the Berklee Performance Center) for the class of 2013's annual Commencement Concert. Nelson was a "surprise" guest onstage, leading the huge, and hugely talented, student orchestra on a big band arrangement of his own standard "Night Life." "Listen to the blues," he sang in his inimitable honk, taking a couple of idiosyncratic solos on his trusty Trigger, the battered old classical guitar he's played for decades. 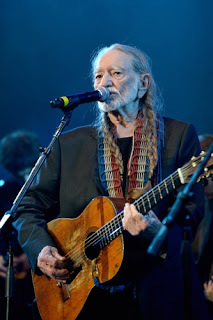 In a black jacket and his trademark braids, with a red, white and blue guitar strap around his neck, Nelson was flanked by sons Micah and Lukas as he welcomed to the stage old friend (and onetime Rhodes Scholar) Kris Kristofferson, who joined his outlaw brother on a suitably ragged version of Hank Williams' "Jambalaya (On the Bayou)." The Commencement Concert is a showcase for graduating seniors, who pay tribute to the year's honorees. (In recent years, honorary degrees have been bestowed upon Aretha Franklin, Smokey Robinson and Burt Bacharach, to name a few.) Berklee being a kind of finishing school for talented young musicians, the emphasis is on professionalism, yet the students showed off some heartfelt performances that would make the elimination rounds of yourIdols and your Voices pointless. Lennox, who received a standing ovation for her startling version of her 1992 song "Cold," was followed onstage by student Vince Cannady, who sang an equally impressive version of the Eurythmics smash "Here Comes the Rain Again." King, taking in the concert a few rows from the stage, did not perform, but she did do "The Locomotion" onstage, a huge grin on her face, with dozens of student musicians during an encore. Other highlights included Samantha Schultz's polished lead vocal on King's "It's Too Late," which she opened alone with a guitar, and a spirited girl-group medley of some of King's biggest hits for the Shirelles, the Chiffons and others, including "Will You Love Me Tomorrow" and "One Fine Day." Noe Socha, a graduating student from Italy, blew away the crowd with his virtuoso soloing on steel guitar and harmonica during Fred Rose's "Blue Eyes Crying in the Rain," which Nelson made his own on his classic album Red Headed Stranger. Before Nelson took the stage, the Berklee Roots Ensemble came to the fore, playing an acoustic hootenanny medley of Nelson's "Darkness on the Face of the Earth" and Bob Wills' Western-swingin' "Stay All Night, Stay a Little Longer," with which Willie charted in 1973. With at least a dozen fiddlers, three guitarists, a crack banjo player and more, this big group of students from New Jersey, Canada, New Zealand and elsewhere could pull up a bus in front of the Grand Ole Opry tomorrow. "I hope you're feeling the love tonight," said Berklee Provost Lawrence Simpson, introducing the honorees early in the show. With hands on hearts, there was no doubt King and Lennox were feeling it. Nelson was moved in his own way, he told the Boston Globe. With his new doctorate, he said, "I was going to ask them if I could write my own medication."